How do you spend 50 hours playing a game with a 25 minute campaign? It helps if the game in question has been available in various forms for 13 years of course, but nevertheless, the amount of time it’s possible – arguably compulsory – to plough into Ikaruga slight-offering requires justification to rational human beings. Partly through habit, partly through the realities of a review queue, I’ve played some of my favourite games only once. How do you spend more time in five short chapters than in Human Revolution, Portal 2 or Dishonored? Let’s start from the top. 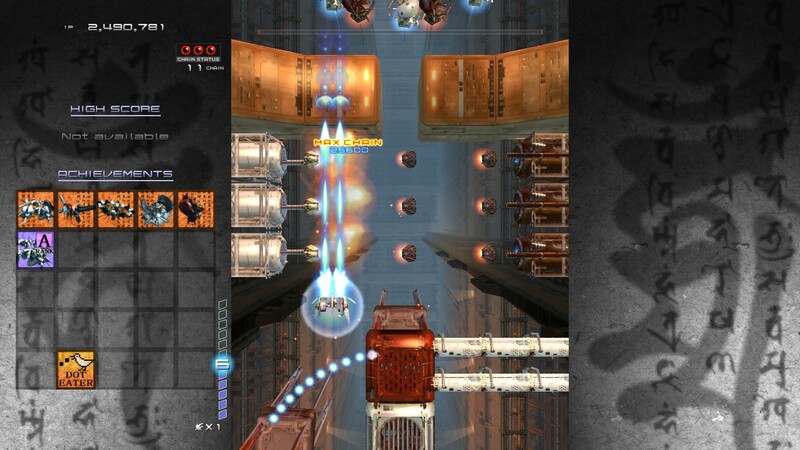 Ikaruga is a vertical scrolling shoot-em-up from Treasure (masters of the form and several other classic genres). 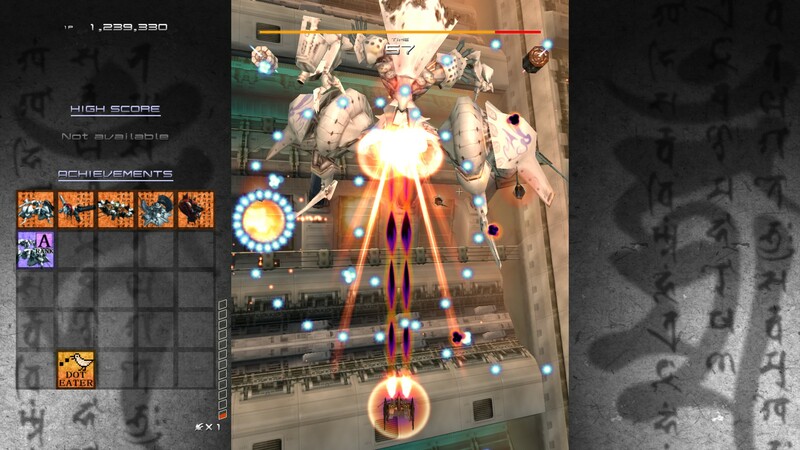 Ikaruga was a conscious step-back from the developer’s last effort (SEGA Saturn/ST-V classic Radiant Silvergun), stripping away the complex weapon management and aligning the players guns to a simple black/white polarity mechanic shared by all enemies. When black, your ship does double damage to white opponents, is vulnerable to white bullets but can absorb black bullets to charge a homing attack. In white mode, the effects are reversed. The chapter three mid-boss remains one of the most intense trial-by-fires in gaming – Insanely rewarding to survive unscathed. Grappling with the polarity mechanic will see you through to the end of the game before long, at least on Easy (and almost certainly with a handful of continues – which will disqualify you from posting a high score on this version’s online leaderboard). Kick the difficulty up to Normal or Hard and you’ll have to contend with ships that explode in a shower of appropriately polarised bullets, complicating your mission considerably. It’s perhaps on the uppermost difficultly setting that Ikaruga can rightfully be considered a bullet-hell shooter – but that’s where its reputation firmly lies, unnecessarily alienating a good section of the audience. On either Easy or Normal the game is challenging without being punishing, allowing you to focus on the highly rewarding scoring system: to shoot up the leaderboard, you need to destroy enemies in colour-matched groups of three to sustain a chain. Again, this is deceptively easy – enemies fly at you from every which way, and unravelling the best route through them is a challenge of memorisation and dexterity. Thankfully, modern Ikaruga gives you everything you need to learn the levels: the leaderboards feature downloadable replays that can be studied for perfect routes. Can’t work out their exact combination of movement, screen-position and shot timing? You can practice your own method through the easily unlocked chapter select (and look out for the ‘easy menu’ option if you want to cut down waiting times on restarts). Ikaruga isn’t all break-neck intensity – there’s enough spots where you pick up easy chains, slowly getting you hooked on the score system. 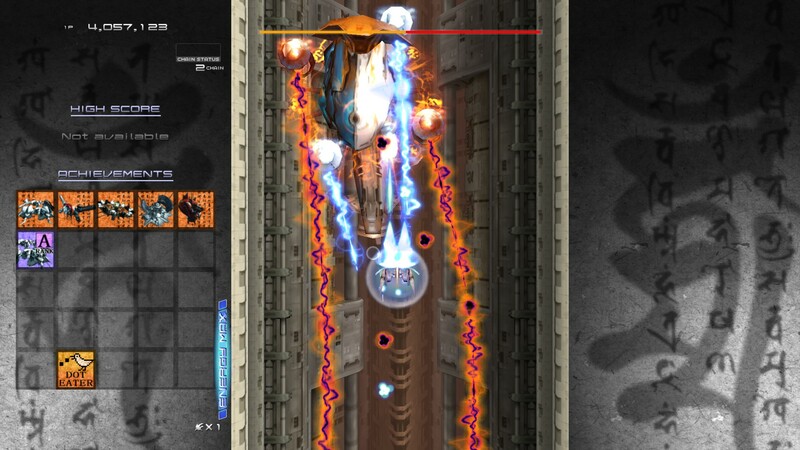 That unreachable, perfect run drives you forward for a lot of your Ikaruga playtime. Mastering a level could be compared, at least superficially, to learning a song – at the very least, the game’s constant forward crawl and emphasis on perfect timing on a succession of coloured marks shares a lot with the typical rhythm game. But this only really explains the long tail of the experience. For all the zen-like, dot-eating mastery that you’ll strive for in the long term, Ikaruga’s early appeal is sustained remarkably effectively by the base elements of gaming that we’re often so quick to dismiss. Developed for the now antique hardware shared by the Dreamcast and Naomi arcade board, Ikaruga isn’t exactly pumping polygons, but it still looks fantastic. This world of elaborate black and white mecha – always accented by reds and blues respectively – is an alluring invention. The art design gives us a unique science fiction world that is more inventive and arresting than the worlds spun out of a long list of triple-A miscellany. The music is rousing, building to some strangely affecting moments near the tail end of the game. The sound effects are pitch perfect, whether digitally screaming at you on a boss approach or punctuating your deft control with explosions and that impossibly unrepetitious chorus of ‘MAX CHAIN, MAX CHAIN, MAX CHAIN’. 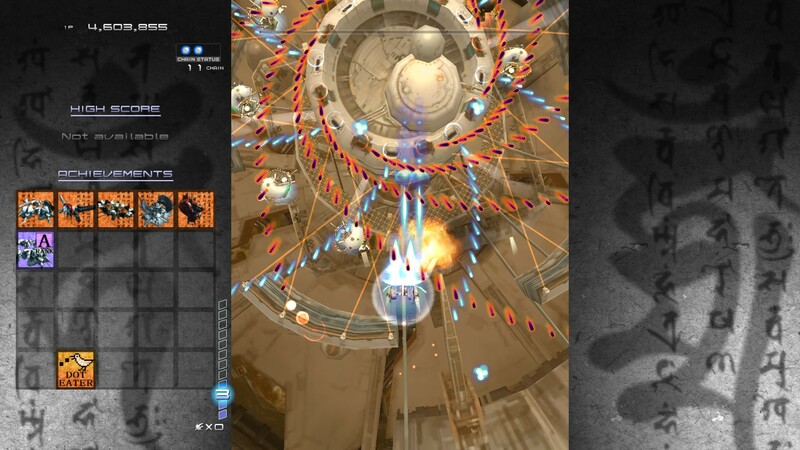 For the record, playing Ikaruga and taking screenshots is about as easy as licking your elbow. There is no perfect game, but Ikaruga is a singular title that couldn’t have been crafted any differently. The game barely has a story, but I wouldn’t even want to spoil its ending. Is this the perfect version of the game? This Steam version builds upon the 360 version, offering more control and resolution options, using Steam’s equivalent achievement and scoreboard features. The omission of online co-op (present on XBLA) means that it isn’t exactly definitive, but this will be a sticking point for few. The greatest injustice would be to dock a game like this a few points for lacking instant and wide appeal, or to utter the indefensible words “It’s not for everyone”. For every person looking at this game and correctly identifying a game they could never possibly like, there’s several others who’ll continue to ignore it both because it seems impenetrable and because 13 years of discourse have sometimes over-emphasised the bizarre upper-end of the skilled game and ignored its immediate charm. Naturally, the option to display the game in the native ‘tate’ (portrait) mode is carried over from previous versions – great news, considering that (unlike most TVs) PC monitors are actually designed to swivel. Don’t disqualify yourself from playing this game. You’re probably never going to be someone who can complete the entire game on a single credit playing as both ships, but there’s so much more fun to be had at the shallow end of play than you’d think at first glance. 50 to 5,000 hours of fun, in fact. Review based on digital copy purchased by reviewer (platform in bold) and 40 hours of play on previous versions. Please check this post for more on our scoring policy. Errmmm maybe I played that? At some point….arcade was never my strong point of gaming history.